Monthly potluck for Youth First Communion, Middle School Youth Ministry, High School Youth Ministry, and Confirmation youth and families on the Parish Plaza after 5 pm Mass! This is a great opportunity for the greater Parish and Youth Ministry family to unite and break bread together. We gather in the Parish West Hall for fellowship, faith sharing, ideas/suggestions for fundraising/community service, and refreshments! HIGH SCHOOLERS: Mark your calendars! Fridays at 7:30 am... Breakfast with the King! We go to 7:30am Mass followed by a quick bite at McD's before school starts! 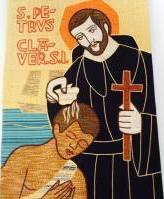 "To do justly, love mercy, and walk humbly" (Micah 6:8), The mission of Saint Peter Claver Youth Ministry is to welcome all youth to be inspired by Christ and encouraged by our community to deepen their relationship with God. We strive to empower the young members of our Parish so they may discover their gifts and have the courage to use them as a disciple of Jesus.